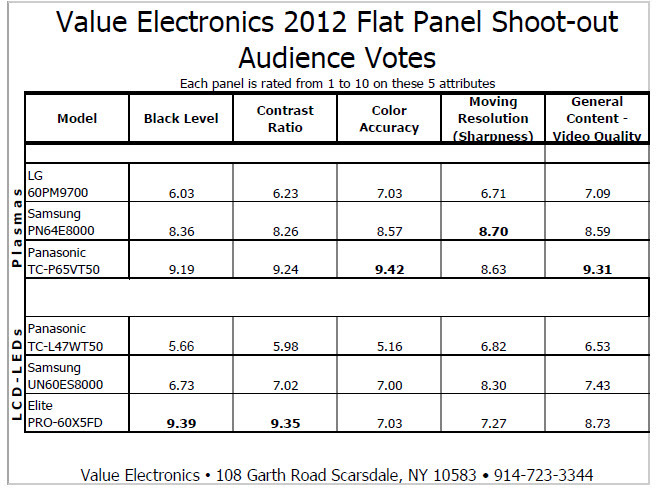 The eighth annual Value Electronics flat panel shootout was held on May 19 and May 20 at in Scarsdale, NY. 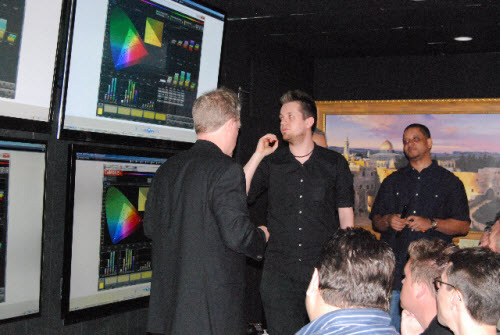 The three highest end plasmas and LCD’s (in the opinion of Value Electronics) encompassing 55 to 65-inch displays from Panasonic, Samsung, LG, Sony, and Sharp’s new Elite were assembled in a darkened room and calibrated by a team of experts (using professional tools) over the course of 3 days. Dr. Larry Weber, who is widely considered the inventor of the plasma display, was in attendance where he gave a presentation and took questions from the audience. Both experts and consumers independently judged the panels and registered votes after viewing a series of test patterns and content clips. Both groups chose the Panasonic VT50 as this year’s winner.